In United States v. Musto, 2017 U.S. Dist. LEXIS 40862 (MD PA 2017), here, the court denied Musto's motion to dismiss and motion to suppress. The motion to dismiss was from a superseding indictment with two counts of tax perjury, § 7206(1), and one count of tax obstruction, § 7212(a). I don't think, from a legal perspective, there is anything new or unusual in the case. 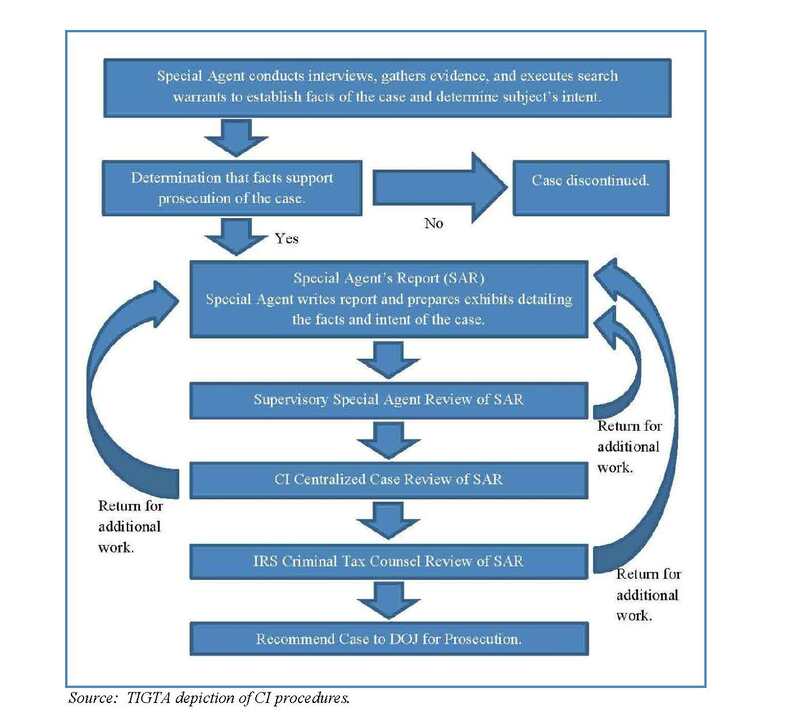 I post the case because, in denying the motion to dismiss, the court covers the process whereby the Government, in executing a search warrant, establishes a "taint team" consisting of personnel not involved in the investigation to review evidence to see whether it is privileged and, if so, make sure that evidence is not reviewed by the investigative team, thus tainting the investigation. n5 Prior to executing the five search warrants on April 28, 2016, the government organized a filter team, also known as the taint team. (N.T. at 52-55). The filter team examined seized evidence to determine whether any of the seized materials were potentially privileged. (N.T. at 154). If the filter attorney determined the seized materials were privileged, these materials were returned to defense counsel, without the prosecution team ever reviewing them. (N.T. at 154-55). The case has a further wrinkle in that, prior to delivery to the taint team, two IRS agents involved in the execution of the search warrant had reviewed the notebook in question, marked "attorney-client privilege." One of the agents apparently was not involved in the investigation but simply assisting in the execution of the search warrant. The other agent was involved in the investigation but, upon review of the privileged material, was immediately re-assigned to the taint team so that his review would not infect the integrity of the investigation. The Court found that none of the privileged material was disclosed to the investigative team. In United States v. Williams, 2017 U.S. App. LEXIS 5184; 2017 FED App. 0173n (6th Cir. 2017) (nonprecedential), here, the Court affirmed the Williams' convictions for tax perjury (3 counts) with respect to his personal returns and aiding and assisting (17 counts) with respect to returns he prepared for others. His arguments for reversal of the tax perjury convictions caught my attention. Because the opinion itself is a bit cryptic, for more detail I offer readers the two briefs that were filed. There were two fact patterns for his personal return convictions. For the year 2004, his business operations were through his tax return preparation S corporation. The filed a false S corporation return reporting a $745 loss. He then filed his personal return, Form 1040, reporting a $1 gain on Schedule C but apparently omitting the amount from the S Corporation. He had thus overreported the income solely by reference to the S Corporation's return K-1. He claimed that there was no perjury with respect to his Form 1040. He complained that the Government had not prosecuted him for the false return he actually filed for the year -- the S Corporation but, rather, improperly prosecuted him for the "literally true" return that he did file which, based on my math, overreported his income for 2004 if the S Corporation return set what he was supposed to report on his personal return. Of course, any falsity on the personal return can be prosecuted as tax perjury. Overreported income, if false, can be prosecuted. And, of course, here, Williams did not report the S Corporation loss but reported $1 of Schedule C income when a Schedule C business did not even exist. In 2004, Williams reported that Imperial experienced a loss of $745 on the company's corporate tax return. He reported one dollar of income on his personal income return, using Form 1040. According to Williams, because Imperial's tax return showed that "the corporation did not report any income, [he] did not have an affirmative duty to report a positive income figure on his individual Form 1040 return." This argument is untenable. "Section 7206 is a perjury statute that criminalizes lying on any document filed with the IRS." Tarwater, 308 F.3d at 504 (emphasis added). If an individual lies on a corporate tax return, he cannot copy that false information onto a personal tax return and claim it as "literal truth." Rather, the tax return would contain information known to be untrue. Williams correctly points out that the government did not charge him with preparing false returns on behalf of the corporation, but because Imperial's income flows through to Williams, evidence of corporate earnings is relevant to determining Williams's personal income. At trial, an IRS agent testified that he found unreported income for Williams for the 2004 tax year, explaining that he found a number of deposits made into Imperial's bank account in 2004 totaling over $21,000. The jury was shown a summary schedule of these deposits, and the agent testified that these deposits were income from tax-preparation services. The agent further testified that Williams was the only individual who was involved with Imperial, or who obtained any financial benefit from Imperial. Finally, the agent testified that Imperial's corporate tax return for 2004 did not explain the one dollar reported by Williams on his personal tax return, despite the fact that Williams claimed that the one dollar was earned in connection with Imperial. This testimony provided a sufficient basis from which the jury—or any rational trier of fact—could have found beyond a reasonable doubt that Williams knew that his tax return for 2004 was not true and correct as to every material matter. "Under penalties of perjury, I declare that I have examined this return and, to the best of my knowledge and belief, it is true, correct, and accurately lists all amounts and sources of income I received during the tax year." So, he was alerted that that his reporting was amiss and that was enough. Although the parties briefed a key Form 1040EZ tax perjury case, United States v. Reynolds, 919 F.2d 435 (7th Cir. 1990), the Court in Williams does not mention Reynolds. I would like to discuss Reynolds briefly because Williams may have been inspired by Reynolds when he started improperly using the Form 1040EZ. On Saturday, I posted a long blog entry on a TIGTA Report. TIGTA Report on Criminal Enforcement Against Employment Tax Noncompliance (Federal Tax Crimes Blog 3/25/17), here. In that blog entry, amid long excerpts from the report, I included several graphics from the TIGTA Report that I think are worth pulling out and posting in a separate blog entry because otherwise readers may not have focused on them in that very long blog entry. Those graphics might be particularly useful for students or new practitioners in the tax crimes area. In one case, I also provide the surrounding narrative for context (but refer readers to the earlier blog entry for more of the context narrative). 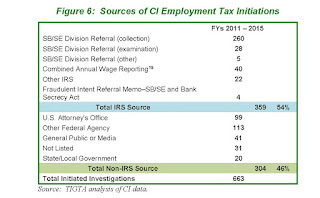 Employment tax investigations represent a small portion CI casework. 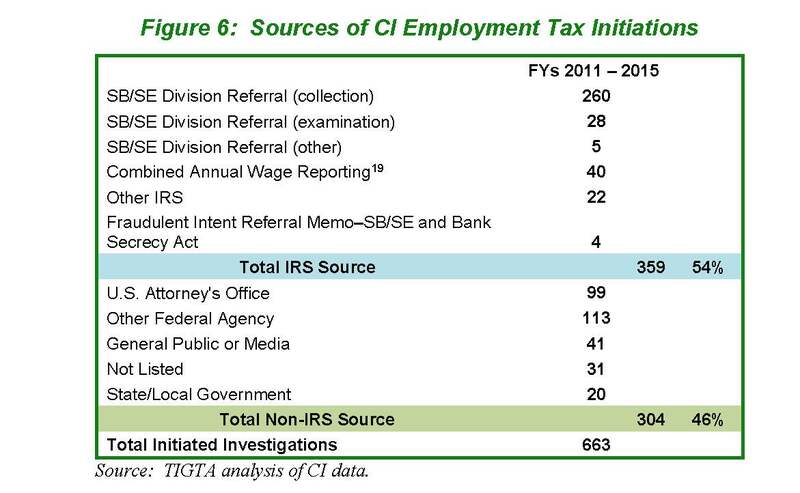 For example, in FY 2015, CI initiated 102 employment tax investigations, which is less than 3 percent of all initiated cases. In comparison, the top two priorities—identity theft and abusive return preparer fraud and questionable refund fraud—resulted in almost 1,800 new investigations and accounted for 47 percent of new initiations in FY 2015. 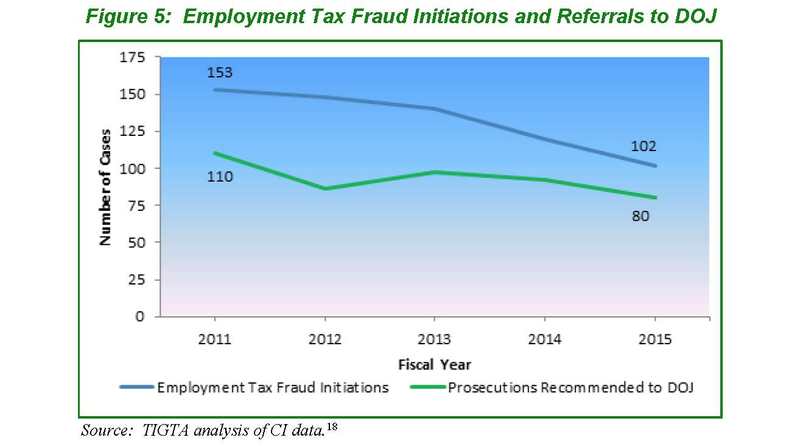 Figure 5 shows the number of employment tax cases initiated and referred for prosecution from FYs 2011 through 2015.
n18 Since actions on a specific investigation may cross fiscal years, the data shown in cases initiated may not always represent the same universe of cases shown in other actions within the same fiscal year. NOTE TO READERS, FOR A BETTER VIEW OF THE GRAPHICS IN THIS BLOG, CLICK ON THE GRAPHIC. 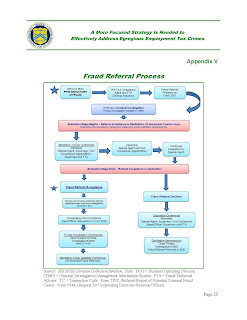 TIGTA issued a report titled A More Focused Strategy Is Needed to Effectively Address Egregious Employment Tax Crimes (Ref # 2017-IE-R004 3/21/17), here. I highly recommend the report to readers, both those watching the trajectory of criminal tax prosecutions and for students wanting to know more about the process. I will report on some of the key features here to encourage readers to read or at least puruse the whole report. I briefly introduce the key context for the report. Employment taxes withheld from employee compensation and remitted to the IRS are the backbone of our tax and FICA system. There must be robust incentives to encourage compliance by employers and those within the employer organization reponsible for employment tax withhold and payment to the IRS. Those incentives include the standard range of civil and criminal penalties applicable to employers that apply to tax noncompliance. But employment tax noncompliance requires that the penalty disincentives include potential civil liability and criminal penalties of those inside the employer organization that were responsible for the employment tax noncompliance. The Trust Fund Recovery Penalty ("TFRP") in § 6672, here, is a civil collection mechanism whereby persons within an employer organization required to withhold, collect and pay over employment taxes from the compensation paid employees can be held civilly liable for those taxes. Liability requires that the person have acted willfully. The parallel criminal penalty for that failure to withhold, collect and payover employment taxes is in § 7202, here. That provision imposes up to a 5-year incarceration period for each failure. Liability requires that the person have acted willfully, but this is generally perceived as a higher level of willfulness than required for the TFRP. The IRS investigates failures to withhold, collect and pay over. Where it can, it tries to collect from the employer. In order to insure collection, it may assert the TFRP against persons it believes are responsible for the noncompliance. An IRS collection officer investigates the delinquent employment taxes and makes determinations as to potential TFRP liability. 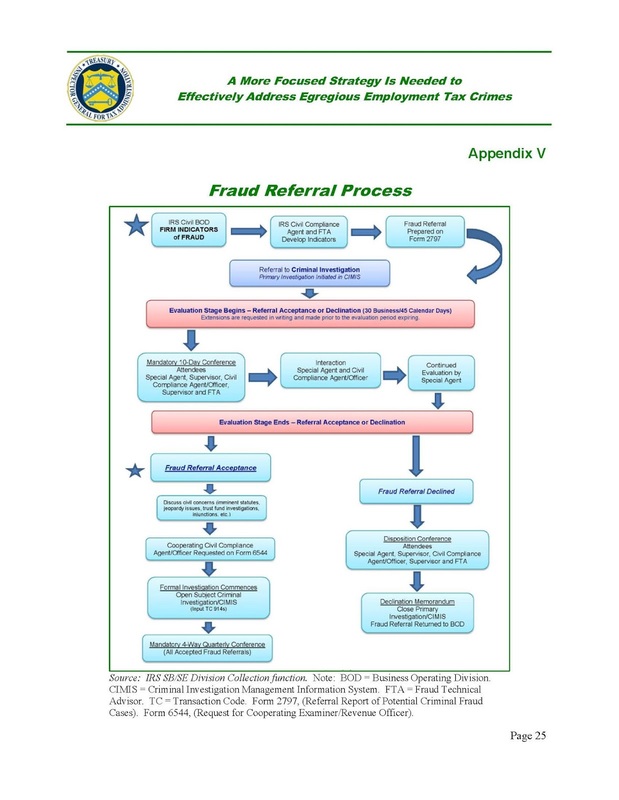 The IRS collection officer will also look for indicators and fraud and, if firm indicators of fraud (also called badges of fraud) are found, may, in conjunction with his supervisor and the fraud technical adviser, refer the the case to IRS Criminal Investigation ("CI") to consider whether the case should be further investigated for potential criminal prosecution and referred to DOJ Tax Criminal Enforcement Section. Employment tax noncompliance is a serious crime. Employment taxes finance Federal Government operations plus Social Security and Medicare. When employers willfully fail to account for and deposit employment taxes, which they are holding in trust on behalf of the Federal Government, they are in effect stealing from the Government. As of December 2015, 1.4 million employers owed approximately $45.6 billion in unpaid employment taxes, interest, and penalties. The TFRP is a civil enforcement tool the Collection function can use to discourage employers from continuing egregious employment tax noncompliance and provides an additional source of collection for unpaid employment taxes. 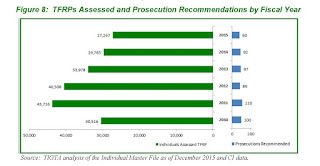 In FY 2015, the IRS assessed the TFRP against approximately 27,000 responsible persons—38 percent fewer than just five years before as a result of diminished revenue officer resources. In contrast, the number of employers with egregious employment tax noncompliance (20 or more quarters of delinquent employment taxes) is steadily growing—more than tripling in a 17-year period. For some tax debtors, assessing the TFRP does not stop the abuse. 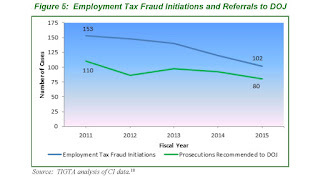 Although the willful failure to remit employment taxes is a felony, there are fewer than 100 criminal convictions per year. In addition, since the number of actual convictions is so miniscule, in our opinion, there is likely little deterrent effect. The TIGTA recommended that the Commissioner, Small Business/Self-Employed Division and the Chief, CI, should consider a focused strategy to enhance the effectiveness of the IRS’s efforts to address egregious employment tax cases. This strategy should include use of data analytics to better target egregious employment tax noncompliance, including identification of high-dollar cases and individuals with multiple companies that are noncompliant. 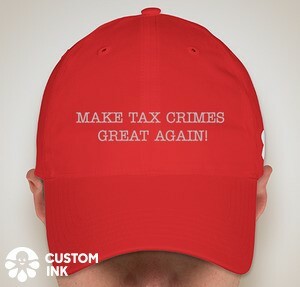 In addition, the Collection function should expand the criteria used to refer potentially criminal employment tax cases to CI to include any egregious cases (not only those where a firm indication of fraud is present). The IRS partially agreed with our recommendation. The IRS agreed with the portion of our recommendation describing a focused strategy to enhance effectiveness of the IRS’s efforts to address egregious employment tax cases by citing various initiatives in process and completed. However, the IRS did not specifically address our recommendation to enhance the use of data analytics. 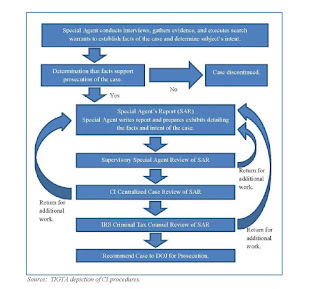 The IRS disagreed with the portion of our recommendation that the Collection function should expand the criteria used to refer potentially criminal employment tax cases to CI to include any egregious cases (not only those where a firm indication of fraud is present) citing the need to balance several factors by a number of stakeholders and limited government resources including limitations on the number of criminal tax cases the United States Attorneys and the US Courts can accommodate. Management’s response to the draft report is included as Appendix IX. I previously had several blogs on the attempt by Bernhard Gubser to contest the burden of proof issue for the FBAR willful penalty through nontraditional means. The most recent is this: Case on Appeal to Fifth Circuit on Standard of Proof for FBAR Willful Penalty (Federal Tax Crimes Blog 11/16/16), here. Mr. Gubser complained that the Government's burden of persuasion on the FBAR willful penalty should be clear and convincing rather than preponderance. He alleged that the Appeals Officer had represented that he would win if the burden of persuasion were clear and convincing rather than preponderance. It appears that Mr. Gubser failed to persuade the Fifth Circuit of the merits of his argument -- at least on whether he made the argument via the right process. On March 22, 2017, in a short per curiam nonprecedential opinion, the Fifth Circuit rejected Mr. Gubser's bid. Gubser v. United States, 119 AFTR 2d ¶ 2017-532 (5th Cir. 2017), here. UBS (UBSG.S) and its French subsidiary face trial in France after a long-running investigation into allegations that the Swiss bank helped wealthy clients avoid taxes. I recently reported on the IRS John Doe Summons for bitcoin records of Coinbase. IRS seeks John Doe Summons to Bitcoin Firm (Federal Tax Crimes Blog 11/23/16; 11/30/16), here. That matter is still churning as the parties spar over whether and how Coinbase should comply. Part of the sparring undoubtedly involves negotiations between the IRS and Coinbase, but some of the sparring is on the public record in court. Fortune has this article about a recent filing: Jeff John Roberts, Only 802 People Told the IRS About Bitcoin - Lawsuit (Fortune 8/19/17), here. The principal feature of the Fortune article is a new filing of an IRS affidavit in the court case. The filing is styled: Declaration of David Utzke in Support of Petition to Enforce Internal Revenue Summons. The article links the affidavit on the Scribd website here. I refer readers to the affidavit which provides some detail into the operation of the bitcoin virtual currency. Also, the affidavit indicates a low level of tax compliance on Form 8949 for bitcoin users. The article also indicates that this JDS initiative may be an opening gambit for negotiations that may result is Coinbase producing less than the universe of documents requested in the JDS. Finally, it's unclear if the IRS is also targeting other virtual currency operators. While Coinbase is the most popular and mainstream bitcoin platform, there are numerous others. Meanwhile, the growing value of other virtual currencies, including Ethereum, mean firms that offer such currencies could soon find themselves in the cross-hairs of the IRS too. I previously reported on United States v. Chabot, 793 F.3d 338 (3d Cir 2015), here, an almost garden-variety case enforcing a grand jury subpoena for production of foreign bank account records. See Third Circuit Applies Required Records Doctrine to Require Taxpayers to Respond to Compulsory Process About Foreign Bank Account (Federal Tax Crimes Blog 7/18/15), here. Yesterday, the Third Circuit issued another opinion after Eli Chabot was held in contempt on remand for failure to comply. United States v. Chabot, 2017 U.S. App. LEXIS 4355 (3d Cir. 2017) (nonprecedential), here. supplemental evidence, including a medical report questioning Eli's capacity to testify. They also submitted several letters from their foreign counsel and a report from an accounting firm denying that the Chabots had the requisite connection to any foreign financial accounts necessary for them to maintain documents under the Bank Secrecy Act. [T]he Government satisfied its initial burden, Chabot had to establish his "present inability to comply with the order in question." Gov't Br. 13. The Court found that Chabot failed to establish he lacked the requisite connection to the foreign financial accounts and held Chabot in civil contempt, ordering him to pay $250 per day as a coercive sanction. The Court of Appeals held that, once the Government establishes (1) a valid court order; (2) Chabot's knowledge of the order and (3) disobeyance of the order, the burden shifted to Chabot to either produce the records or establish a present inability to comply. (Citing United States v. Rylander, 460 U.S. 752, 757 (1983)). The court then cryptically held that the trial court had properly held Chabot in contempt. According to court documents, Masud Sarshar, a U.S. citizen, maintained several undeclared bank accounts at Bank Leumi and two other Israeli banks, both in his name and in the names of entities that he created. Sarshar owned and operated Apparel Limited Inc., a business that designed, manufactured and sold clothing and other apparel. For decades, with the assistance of at least two relationship managers from Bank Leumi and a second Israeli bank (Israeli Bank A), Sarshar hid tens of millions of dollars in assets in these accounts in an effort to conceal income and obstruct the Internal Revenue Service (IRS). Between 2006 and 2009, Sarshar diverted more than $21 million in untaxed gross business income to those undeclared accounts and earned more than $2.5 million in interest income from the funds. Sarshar reported none of this income on his 2006 through 2012 individual and corporate tax returns. He also filed false Reports of Foreign Bank and Financial Accounts, commonly known as FBARs, with the U.S. Department of Treasury on which he omitted his ownership and control of these offshore accounts. Sarshar’s relationship managers at Israeli Bank A (RM1) and Bank Leumi (RM2) visited him frequently in Los Angeles. At Sarshar’s request, neither bank sent him his account statements by mail. Instead, RM1 and RM2 provided Sarshar with his account information in person. RM2 concealed Sarshar’s account statements on a USB drive hidden in a necklace that she wore when she visited Sarshar in the United States. Sarshar’s meetings with RM1 sometimes occurred in Sarshar’s car. RM1 and RM2 used their visits to offer Sarshar other bank products, including “back-to-back” loans. Through back-to-back loans, which Bank Leumi made to Sarshar through its branch in the United States and which Sarshar collateralized with funds from his account at Israeli Bank A, Sarshar was able to bring back to the United States approximately $19 million of his assets without creating a paper trail or otherwise disclosing the existence of the offshore accounts to U.S. authorities. At the direction of RM1 and RM2, Sarshar also obtained Israeli and Iranian passports in an effort to avoid being flagged as a U.S. citizen by the banks’ compliance departments. The banks still flagged Sarshar as a U.S. citizen after Sarshar received these two passports, so RM1 and RM2 advised him to transfer his remaining funds from Israeli Bank A to Israeli Bank B, which Sarshar did in late 2011. In addition, with the help of someone identified as Individual 1, Sarshar transferred approximately $5.8 million from his Bank Leumi accounts to an account at Hong Kong Bank A, which Individual 1 then helped transfer to Sarshar in the United States, disguising it as a loan to Apparel Limited. In addition to the term of prison imposed, Sarshar was ordered to serve three years of supervised release and to pay more than $8.3 million in restitution to the IRS, plus interest and penalties. Sarshar also agreed to pay an FBAR penalty of more than $18.2 million for failing to report his Israeli bank accounts. I offer these comments from the linked documents. In United States v. Ballard, ___ F.3d ___, 2017 U.S. App. LEXIS 3832, 2017 FED App. 0051P (6th Cir. 2017), here, the taxpayer lied to an IRS CI special agent about his employment and the timing of his income (attributing it to prior years). The taxpayer was charged for tax obstruction, § 7212(a), here. He pled guilty to that charge. The issue was the appropriate Sentencing Guideline to apply -- the tax Guideline under § 2T.1 or the obstruction of justice Guideline under § 2J1.2. Where two possible Guidelines can apply, the Guidelines instruct that the "most appropriate" Guideline to the conduct applies. U.S.S.G. App. A, Introductory cmt. 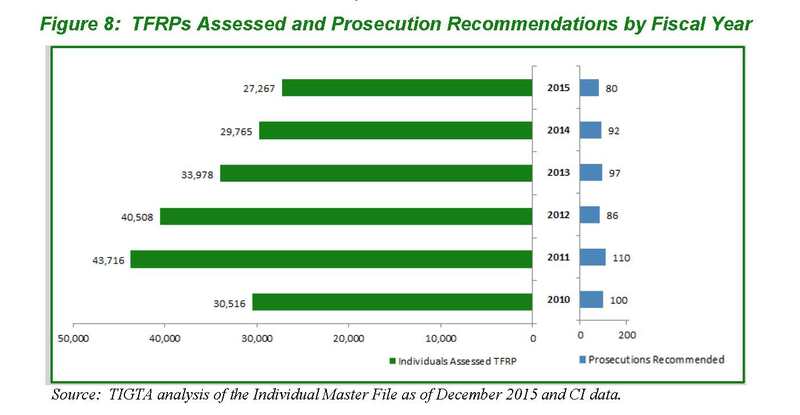 The taxpayer preferred the obstruction Guideline because it produced the lower sentencing range. The sentencing court held that the tax Guideline applied. Given the tax context, that holding does not seem unexceptional. But, one has to give the taxpayer some credit for trying. What was his argument? He urged that he really did not have an intent to evade tax, because all he was doing was trying to delay payment of the tax. Ergo, he alleged, the crime was obstruction rather than a tax crime. Here is how the sentencing court framed the taxpayer's argument in rejecting it: "he never intended to evade paying his taxes but was merely delaying the payments (merely obstructing justice in other words) until he made real money—apparently more than $500,000 a year." The district court thought the most appropriate guideline for Ballard's crime was § 2T1.1, and so do we. Consider the description of his offense conduct, as outlined in the indictment: that he "falsely stat[ed] to an Internal Revenue Service—Criminal Investigations Special Agent investigating [Ballard's] outstanding debt for taxes due . . . that commission checks [Ballard] received from NFP Securities, Inc. in January 2009, April 2009, May 2009, June 2009, August 2009, and December 2009 were for work done at an earlier date, and that he was not working in 2009, whereas in truth and in fact [Ballard] then well knew that these commission checks were for work done" in the months the checks issued. R. 1 at 1. This is just the sort of "Willful Failure to . . . Supply Information or Pay Tax" that § 2T1.1 is built for. He lied to an IRS agent. Why? To throw off the investigation of his "outstanding debt for taxes." R. 1 at 1. That offense conduct could have been charged under other statutes punishable under § 2T1.1. See, e.g., 26 U.S.C. §§ 7201 (tax evasion), 7203 (willfully failing to supply required information). And the government would have incurred a tax loss of over $800,000 if that lie, in conjunction with his many other uncharged evasions, had succeeded. Even if Ballard is telling the truth about always intending to pay his tax bill once he hit it big—even indeed if he had already started repaying his outstanding taxes—§ 2T1.1 has a provision explaining how to account for that circumstance: Change nothing about the tax loss calculation. All of that points to § 2T1.1 as the right guideline. Yes, § 2J1.2 covers a broad genus of obstruction offenses, including Ballard's. But when another possible guideline explicitly includes the offense conduct, in addition to covering offenses that are close cousins of that conduct, that's where the offense belongs. See Neilson, 721 F.3d at 1188-89. Ballard objects. Because he always admitted he owed taxes, because he had always intended to pay them one day, and because the only charged conduct was one false statement, he claims that his offense is more like obstruction of an investigation than tax evasion. Like the district court, we think these points are fair. But like the district court, we think they are unpersuasive in the end. Ballard's promise about intending to eventually pay his taxes is irrelevant to our determination of which guideline is the right one; the only facts that matter are the ones in the criminal information. See U.S.S.G. § 1B1.2; United States v. Malki, 609 F.3d 503, 510 (2d Cir. 2010). Ballard stipulated that he lied to IRS investigators in order to avoid having to pay taxes at that time and that he failed to pay the debt even though he earned a significant income in 2009, conduct quite similar to tax evasion. But even if we looked outside the charges, we have nothing but Ballard's word to indicate that he was going to pay one day. His promise is less than credible, we think, in context—particularly in the context of his efforts to outmaneuver the IRS over a dozen years and the sudden appearance of his noble intentions only after being caught. Nor are we swayed by the fact that the charged conduct was just one lie. The egregiousness of the offense does not determine which of these two sections is appropriate (though it can, and here did, drive the district court to vary below the guidelines range). What matters in the choice between two guidelines sections is which section is more precisely tailored to reflect offense characteristics—like tax evasion and tax loss—and which section covers a more closely related group of crimes. What Ballard did, and what the government charged, was a lie to the tax collector about his earnings. The district court sentenced Ballard accordingly. In Beckles v. United States, 580 U.S. ___ (3/6/2017), here, the Court held that the Sentencing Guidelines, advisory under Booker, are not unconstitutionally vague. The opinion, written by Justice Thomas, reasoned from the historic understanding that a sentencing judge's discretion to render sentences within the statutory range (such as between 0 months and 60 months for tax evasion under § 7201) did not render that statutory discretion unconstitutionally vague. Similarly, the Guidelines do not render sentencing unconstitutionally vague because all they do is provide advice as to appropriate sentences within the statutory range for the counts of conviction, but the discretion is left to the judges just as it had always been. Petitioner Beckles was convicted of possession of a firearm by a convicted felon, 18 U. S. C. §922(g)(1). His presentence investigation report concluded that he was eligible for a sentencing enhancement as a “career offender” under United States Sentencing Guideline §4B1.1(a) because his offense qualified as a “crime of violence” under §4B1.2(a)’s residual clause. The District Court sentenced petitioner as a career offender, and the Eleventh Circuit affirmed. Petitioner then filed a postconviction motion to vacate his sentence, arguing that his offense was not a “crime of violence.” The District Court denied the motion, and the Eleventh Circuit affirmed. Petitioner next filed a petition for a writ of certiorari from this Court. While his petition was pending, this Court held that the identically worded residual clause in the Armed Career Criminal Act of 1984 (ACCA), §924(e)(2)(b), was unconstitutionally vague, Johnson v. United States, 576 U. S. ___. The Court vacated and remanded petitioner’s case in light of Johnson. On remand, the Eleventh Circuit affirmed again, distinguishing the ACCA’s unconstitutionally vague residual clause from the residual clause in the Sentencing Guidelines. Held: The Federal Sentencing Guidelines, including §4B1.2(a)’s residual clause, are not subject to vagueness challenges under the Due Process Clause. Pp. 4–13. (a) The Due Process Clause prohibits the Government from “taking away someone’s life, liberty, or property under a criminal law so vague that it fails to give ordinary people fair notice of the conduct it punishes, or so standardless that it invites arbitrary enforcement.” Johnson, supra, at ___–___. Under the void-for-vagueness doctrine, laws that fix the permissible sentences for criminal offenses must specify the range of available sentences with “sufficient clarity.” United States v. Batchelder, 442 U. S. 114, 123. In Johnson, this Court held that the ACCA’s residual clause fixed—in an impermissibly vague way—a higher range of sentences for certain defendants. But the advisory Guidelines do not fix the permissible range of sentences. They merely guide the exercise of a court’s discretion in choosing an appropriate sentence within the statutory range. Pp. 4–10. (1) The limited scope of the void-for-vagueness doctrine in this context is rooted in the history of federal sentencing. Congress has long permitted district courts “wide discretion to decide whether the offender should be incarcerated and for how long.” Mistretta v. United States, 488 U. S. 361, 363. Yet this Court has “never doubted the authority of a judge to exercise broad discretion in imposing a sentence within a statutory range,” United States v. Booker, 543 U. S. 220, 233, nor suggested that a defendant can successfully challenge as vague a sentencing statute conferring discretion to select an appropriate sentence from within a statutory range, even when that discretion is unfettered, see Batchelder, supra, at 123, 126. Pp. 6–7. (2) The Sentencing Reform Act of 1984 departed from this regime by establishing several factors to guide district courts in exercising their sentencing discretion. It also created the United States Sentencing Commission and charged it with establishing the Federal Sentencing Guidelines. Because the Guidelines have been rendered “effectively advisory” by this Court, Booker, supra, at 245, they guide district courts in exercising their discretion, but do not constrain that discretion. Accordingly, they are not amenable to vagueness challenges: If a system of unfettered discretion is not unconstitutionally vague, then it is difficult to see how the present system of guided discretion could be. Neither do they implicate the twin concerns underlying vagueness doctrine—providing notice and preventing arbitrary enforcement. The applicable statutory range, which establishes the permissible bounds of the court’s sentencing discretion, provides all the notice that is required. Similarly, the Guidelines do not invite arbitrary enforcement within the meaning of this Court’s case law, because they do not permit the sentencing court to prohibit behavior or to prescribe the sentencing ranges available. Rather, they advise sentencing courts how to exercise their discretion within the bounds established by Congress. Pp. 7–10. (b) The holding in this case does not render the advisory Guidelines immune from constitutional scrutiny, see, e.g., Peugh v. United States, 569 U. S. ___, or render “sentencing procedure[s]” entirely “immune from scrutiny under the due process clause,” Williams v. New York, 337 U. S. 241, 252, n. 18. This Court holds only that the Sentencing Guidelines are not subject to a challenge under the void-for-vagueness doctrine. Pp. 10–11. (c) Nor does this holding cast doubt on the validity of the other factors that sentencing courts must consider in exercising their sentencing discretion. See §§3553(a)(1)–(3), (5)–(7). A contrary holding, however, would cast serious doubt on those other factors because many of them appear at least as unclear as §4B1.2(a)’s residual clause. This Court rejects the Government’s argument that the individualized sentencing required by those other factors is distinguishable from that required by the Guidelines. It is far from obvious that §4B1.2(a)’s residual clause implicates the twin concerns of vagueness more than the other factors do, and neither the Guidelines nor the other factors implicate those concerns more than the absence of any guidance at all, which the Government concedes is constitutional. Pp. 11–13. 616 Fed. Appx. 415, affirmed. I have not written on the alleged Caterpillar tax manipulations that were prominently the subject of an investigation by the Senate Permanent Subcommittee on Investigations. The hearings page is here. There is a link to the report titled Caterpillar's Offshore Tax Strategy (which has the hearing date of 4/1/14, but was finalized 8/28/14 per page 2). In very broad overview, the Senate investigation focused on Caterpillar's alleged shifting of profit attributable to U.S. operations from the U.S. tax base to a Swiss tax base where Caterpillar conducted essentially no meaningful operations related to the profits in issue and had negotiated a very low tax rate (essentially free-money for the Swiss government). Tax geeks often refer to this as a transfer pricing issue; the relevant code section for the substantive tax issues is § 482, here. I am told, however, that, according to the SEC filings, the IRS used a substance over form / assignment of income type argument rather than a transfer pricing argument (presumably because, in order to have a legitimate transfer pricing argument the entity to which income is shifted must have some reality -- meaning real costs associated with the creation of the income). Too aggressive positions in this area can have significant civil and criminal penalties. I refer readers to the Senate report that outlines what the Senate thought was objectionable. PEORIA, Ill. – On March 2, 2017, law enforcement authorities entered three Peoria-area Caterpillar Inc. (NYSE: CAT) facilities, including the corporate headquarters, to execute a search and seizure warrant. The warrant is focused on the collection of documents and electronic information. Caterpillar is cooperating with law enforcement. While the warrant is broadly drafted, we believe the execution of this search warrant is regarding, among other things, export filings that relate to the CSARL matter first disclosed in Caterpillar’s Form 10-K filed on February 17, 2015, and updated in Caterpillar’s most recent Form 10-K filed with the SEC on February 15, 2017. On January 8, 2015, the Company received a grand jury subpoena from the U.S. District Court for the Central District of Illinois. The subpoena requests documents and information from the Company relating to, among other things, financial information concerning U.S. and non-U.S. Caterpillar subsidiaries (including undistributed profits of non-U.S. subsidiaries and the movement of cash among U.S. and non-U.S. subsidiaries). The Company has received additional subpoenas relating to this investigation requesting additional documents and information relating to, among other things, the purchase and resale of replacement parts by Caterpillar Inc. and non-U.S. Caterpillar subsidiaries, dividend distributions of certain non-U.S. Caterpillar subsidiaries, and Caterpillar SARL and related structures. The Company is cooperating with this investigation. The Company is unable to predict the outcome or reasonably estimate any potential loss; however, we currently believe that this matter will not have a material adverse effect on the Company’s consolidated results of operations, financial position or liquidity. On January 8, 2015, the Company received a grand jury subpoena from the U.S. District Court for the Central District of Illinois. The subpoena requests documents and information from the Company relating to, among other things, financial information concerning U.S. and non-U.S. Caterpillar subsidiaries (including undistributed profits of non-U.S. subsidiaries and the movement of cash among U.S. and non-U.S. subsidiaries). The Company is cooperating with this investigation. The Company is unable to predict the outcome or reasonably estimate any potential loss; however, we currently believe that this matter will not have a material adverse effect on the Company’s consolidated results of operations, financial position or liquidity.